The WD My Passport Wireless Pro is an external hard drive designed specifically keeping the creative professional in mind thanks to a built-in card reader, wireless connectivity and a robust app to manage the drive and its contents. 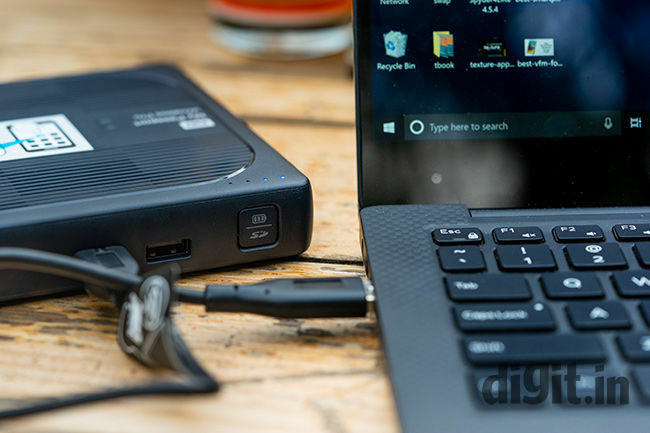 Portable external drives have been a boon for many consumers and professionals alike and for the longest time, the only upgrade this category of products saw was in its connecting port and the maximum storage. Lately, however, there has once again been significant movement on what portable drives can do. A few years ago we got our first portable drive which could create its own Wi-Fi hotspot to enable data exchange between the drive and other wireless devices such as smartphones. 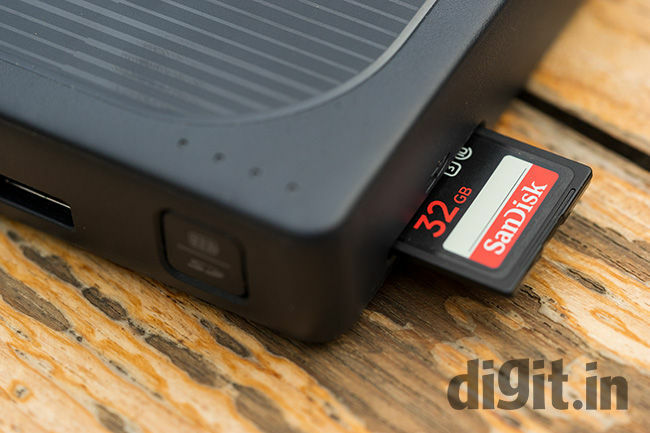 For photographers and content creators, the external drive has always required a laptop and possibly even a card reader. When on long, extended shoots, the laptop is a necessity simply for the purpose of dumping the data that has been shot. For example, if you’re a wedding photographer, taking the laptop on-location poses a risk. The WD My Passport Wireless Pro addresses some of those risks but brings a few of its own. 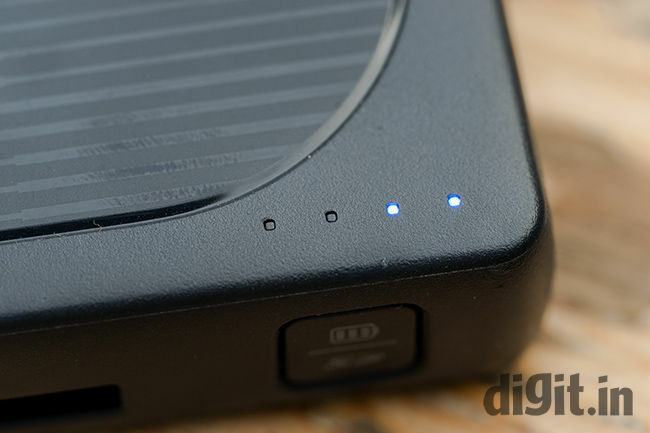 The WD My Passport Wireless Pro is essentially this black box that contains a 2TB hard drive (there is also a 1TB and 4TB variant available) sitting alongside a 6400mAh battery. The battery is there so it can run the Wi-Fi card on the inside to generate its own hotspot so that the data can be access over wireless connectivity. However, the real star of the show happens to be the SD card slot built into the side of this device. In case you are a part of the old guard whose cameras still use CF cards, well, there’s also a USB 2.0 port so you can plug your card reader in here to move files. There is also a USB3.0 port that will allow you to attach this drive to your computer/NAS for easy transfer of all the content that was dumped into it. The internal battery paired with this USB 2.0 port can also be used to charge your smartphone if you find your phone running low on juice while shooting out in the wild. The WD My Passport Wireless Pro is taking a very ambitious shot at the market, and after a few weeks with it, I can see that WD has taken a solid step in the right direction. In all essence, the Western Digital My Passport Wireless Pro is an external drive with a regular 2.5-inch 5400rpm drive spinning on the inside. Its not really meant to be used as an external drive for your computer, but rather, as a field drive for content creators. Being a photographer myself, the utility of a drive like this is immense, but only if it delivers results which are within expectations. For this, I took the drive with me on a photography shoot. The images RAW files shot on a Nikon D850 and recorded onto a 64GB Sandisk Extreme SD card, which has a maximum read speed of 95MB/s. There was 40.2 GB of data on the card that needed to be backed up. The drive required some initial setting up, which is easily done by connecting to its internal Wi-Fi hotspot. The only setting I had to change was to allow the drive to automatically copy SD cards once they are inserted. After enabling the option, I inserted the Sandisk Extreme SD card and the drive took about 20 seconds to initiate the transfer. There are four small LEDs right above the SD button which serve as a progress indicator (for the transfer) and when there is no on-going transfer, it serves to show the internal battery level. Each LED indicates a quarter of the total progress. A blinking LED means the particular quarter is being copied while a static LED means that portion has been copied. To transfer the 40GB of RAW files from the SD card onto the WD Passport Wireless Pro, I first used the internal SD card reader and the files took about 11 minutes to transfer completely, giving me an effective transfer speed of roughly 62MB/second. In comparison, when I plugged the SD card directly into my Dell XPS 13’s internal card reader and copied onto the internal drive of my laptop, the process completed in exactly 8 minutes, which is an effective transfer rate of roughly 85MB/s. When trying to dump the same data with the card plugged into an SD card reader which was then plugged into WD Passport Wireless Pro’s USB 2.0, the transfer rate peaked at roughly 28MB/s. This means that for those of you who shoot on CF cards, the transfer rates will be slow. Transfer over Wi-Fi maxes out at a very slow 17MB/s, making it impractical to move large gigabytes of data. The internal SD card reader on the Passport Wireless Pro is actually quite fast and convenient to use. All data copied in such a manner is organized in a neat, easy to understand manner. Do note that the drive is essentially just cloning the SD card onto the internal drive, and hence, won’t be sorting the data (that resides on the card) in any way. Another convenience the drive offered was the ease of copying data. Over the last 10 days, I have been shooting a lot of products as and when they arrive in our office for review. These photos didn’t need to be edited right away, but the data had to be moved off the cards regardless. Typically, I would shoot the product, insert the card into my laptop, run Lightroom and then initiate the copy process, which further took its own sweet time. With the WD My Passport Wireless Pro, I would just dump the card into the drive, with each shoot’s data taking less than 4 minutes to copy. At the end of the day, I would then just plug the drive into the laptop, fire up Lightroom and edit the images straight from the drive. Once everything was edited, a master export would be made onto our central storage system. 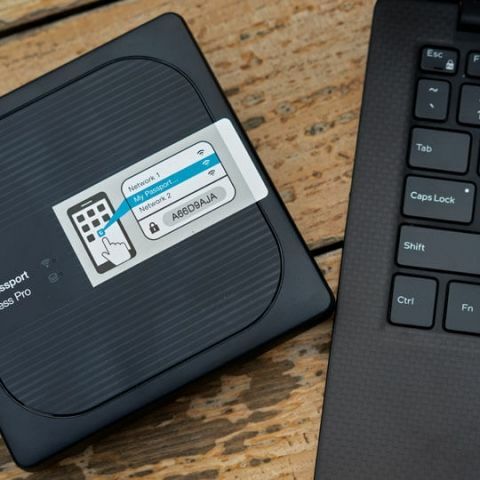 Because of this, the WD My Passport Pro will find plenty of favour with content creators who can always just back up their data onto the drive without the need for a laptop. Wedding photographers would no longer need a laptop and an external hard disk to dump the day’s shoot as everything can be copied onto the WD My Passport Wireless Pro with ease. Another advantage offered by the WD My Passport Pro is that you can view all the files stored on the drive using your smartphone and WD’s My Cloud app. Just connect to the drive’s hotspot and you can view and download the files stored on it. Most RAW formats are also supported and you can download them to your phone for a quick edit, in case you need to share it with the client or even on social media. The app also provides a neat dashboard with quick overview of all the important aspects of the device such as space usage, free space remaining, battery status and even Wi-Fi status. As a photographer, I found the WD My Passport Wireless Pro to be extremely convenient. You can copy your SD card data to it directly and then you can edit those photos directly off the drive when its connected to a computer. You can even access and edit the photos over Wi-Fi on your smartphone. It’s a handy little thing that will be a great addition to any content creators kit. For home users, the drive can also be turned into a media server as it supports a watered-down version of Plex and Twonky. You can have the drive piggy-back off your home’s Wi-Fi to stream movies that may be stored on the drive, but the drive itself is not capable of transcoding any media files. Also, in order for the drive’s Wi-Fi to be active, it needs to be running off the battery. The minute it is plugged into the computer via the USB 3.0 interface, the Wi-Fi shuts off. Essentially, if you want to stream videos from the drive, you’re going to have to run it on the battery, and that won’t last very long. There is just one major concern I have with the drive, and it could literally be a deal breaker for many. The casing on the drive does not provide any kind of shock resistance for the drive inside and I was absolutely terrified of jostling the drive around. The lack of shock dampening means that any hard impacts on the drive could result in damage to the internal drive which could cause drive failure. The SSD variant of this drive would not be susceptible to this problem, but that variant of the drive is not sold in India yet. There is a 6400mAh battery in the drive that WD says will last you about 10 hours of continuous usage. I was able to use the drive for about a week before needing to recharge it, but this was when I was only using it to move data from my Sandisk SD cards. After charging the battery to full one evening, I accidentally left the drive running on battery power overnight and found it with just one dot remaining in the morning. Since I had slept for roughly 7 hours that night, I would say that the battery would last the 10 hours WD says it would. The battery does take around 2 hours to charge fully if you use the provided charger. If you’re going to use the drive as a media server, the battery is going to drain rather quickly, and I would not recommend using the drive this way, except once in a while. The WD My Passport Wireless Pro with 2TB internal storage costs Rs 16,345 on Amazon India and also comes in a 1TB and 4TB variant. You can get a regular 2TB external hard drive for as low as Rs 6500, so the Wireless Pro might seem like an expensive proposition. However, if you are a content creator, the price tag of the WD My Passport Wireless Pro will be absolutely worth it for the convenience and peace of mind it has to offer. With this drive, you don’t need a laptop to manage your shoot’s data. Not only does it function as a field drive for data dumping but plugging it into a computer instantly turns the WD My Passport Wireless Pro into a regular external drive for you to edit off. Personally, I know I will be buying one of these for sure. The WD My Cloud app makes viewing and working with the copied data on a smartphone or a tablet a piece of cake so if you’re on a vacation or out travelling and want to post your photos online, you can just edit them on the phone and not even need to carry a laptop. I only wish WD had built in some shock protection for the drive, without which it will be at risk of failure in case its jostled around harshly. If that does happen, there’s nothing stopping me from swapping the internal HDD for an SSD at a later stage. Can you give a review of Milagrow M8 PRO tablet ?